“X” marks the spot of some intriguing surface activity in the latest picture of Pluto returned from NASA’s New Horizons spacecraft. 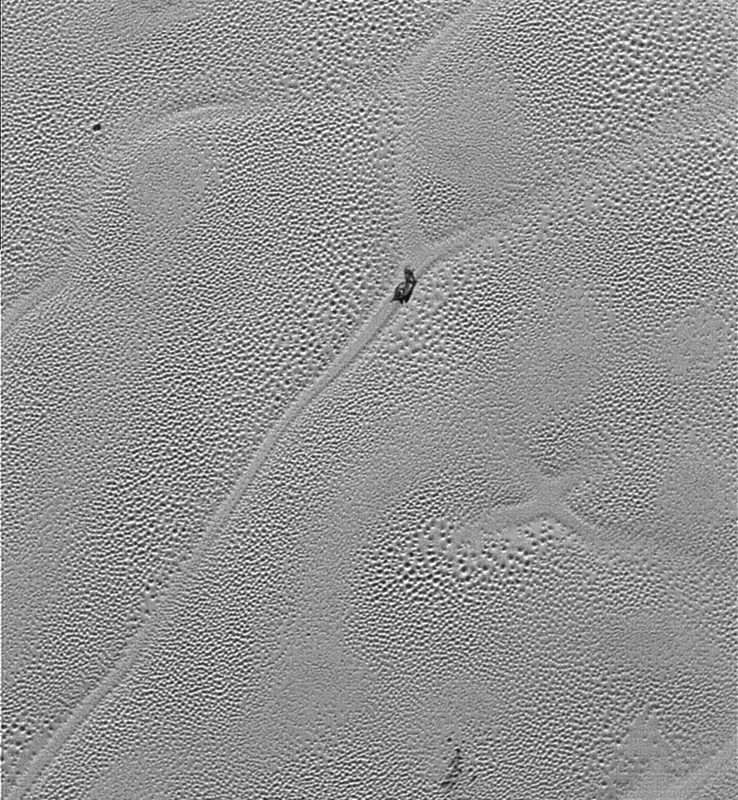 Transmitted to Earth on Dec. 24, this image from the Long Range Reconnaissance Imager (LORRI) extends New Horizons’ highest-resolution views of Pluto to the very center of Sputnik Planum, the informally named icy plain that forms the left side of Pluto’s “heart” feature. Sputnik Planum is at a lower elevation than most of the surrounding area by a couple of miles, but is not completely flat. Its surface is separated into cells or polygons 10 to 25 miles wide, and when viewed at low sun angles (with visible shadows) the cells are seen to have slightly raised centers and ridged margins, with about 100 yards of overall height variation. Mission scientists believe the pattern of the cells stems from the slow thermal convection of the nitrogen-dominated ices that fill Sputnik Planum. A reservoir that’s likely several miles or kilometers deep in some places, the solid nitrogen is warmed at depth by Pluto’s modest internal heat, becomes buoyant and rises up in great blobs, and then cools off and sinks again to renew the cycle. Computer models by the New Horizons team show that these blobs of overturning solid nitrogen can slowly evolve and merge over millions of years. The ridged margins, which mark where cooled nitrogen ice sinks back down, can be pinched off and abandoned. The “X” feature is likely one of these – a former quadruple junction where four convection cells met. Numerous, active triple junctions can be seen elsewhere in the LORRI mosaic. 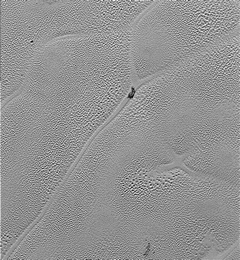 Transmitted to Earth on Dec. 24, 2015, this image from the Long Range Reconnaissance Imager (LORRI) extends New Horizons’ highest-resolution swath of Pluto to the very center of Sputnik Planum, the informally named plain that forms the left side of Pluto’s “heart.” Mission scientists believe the pattern of the cells stems from the slow thermal convection of the nitrogen-dominated ices that fill Sputnik Planum. See the full high-resolution swath of Pluto.